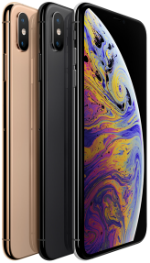 The Apple iPhone Xs Max is a rugged device with a 6.5-inch Super Retina HD display with a 2688x1242 resolution. The phone is powered by a Hexa-Core A12 Bionic chip with storage options of 64GB, 256GB and 512GB. The device has two 12-megapixel rear-facing cameras on the back with 4K video recording. In front, there is a 7-megapixel camera for selfies and video calls. It includes a built-in Li-Ion battery with wireless charging, Face ID, NFC, and Dual SIM capability. The phone runs on iOS 12 upon release. There are three colors to choose from: Gold, Space Gray, and Silver.